Known worldwide for its dramatic beauty, Edmonton offers so much more than just mountains, ask the insiders! Visitors have an abundance of small treasures to look forward to, frozen waterfalls, sand dunes, picnics in the pines, hikes among the hoodoos, water sports, and just so much to be discovered on horseback. Brazeau wrapped around the Yellow-head County and Drayton Valley offers camping neat the rivers and is only an hour and a half away from Edmonton. It is as good as it gets for outdoor enthusiasts enjoying forests, reservoirs and rivers. Currently, there plans for a major resort development offering lodges, cabins and campgrounds as well as kayak and canoe trips, guided horseback tours and tracks for quads and several other activities. With campgrounds already filled over weekends and holidays, it offers companies a great opportunity to invest in the ever-growing Brazeau tourism. A wealth of activities combined with opportunity is the main reason why seven million acres, including Yellow-head County, will soon offer visitors everything they could possibly imagine part of outdoor activities. 11 Nodes are already identified for development and planning is already taking place for the Cougar Rock node near Maskuta Creek and Airport Road. Next to the Jasper National Park gates is the Over lander node, with each of these consists of 1,400 acres. The emphasis on the nodes is the orderly planning and sustainable concepts, which direct most activities away from critical wildlife habitats and fragile watersheds. Everyone living in Yellow-head County is passionate about maintaining the beautiful area and the county partnered with the Foothills Recreation Management Association to enhance several recreational sites at Cadomin, Robb, Edson and Hinton. The whole idea is to attract people towards the camping grounds, which are well maintained and only a small fee is charged, which also include a supply of firewood. Area structure plans have been drawn up and spell out the opportunities as well as constraints based on geotechnical work that reveals, soli structure and water availability limitations. A golf course is part of the structure plan for Cougar Rock, which will also offer condos, a hotel, convenience stores and restaurants as well as walking trails and a vast variety of outdoor activities. The structure plan for Over lander include condos, a golf course and several other facilities. There is indeed a history here, in the general store of Cadomin and the pioneer homes, a string of mining communities once was part of the Alberta Grand Truck Railway’s Coal Branch. The Black Cat Ranch open to quests was established in 1935 and got its name from a black cat, an eerie image of one was seen near the fire-scarred hills. 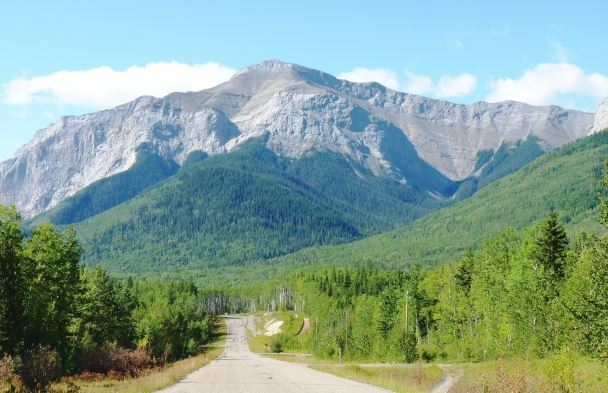 The Hamlet of Peers is over 100 years old and still served by the Rosevear ferry, while comfortable trail rides offer visitors the changes to explore the mountain routes on horseback or climb the canyons with safety gear.